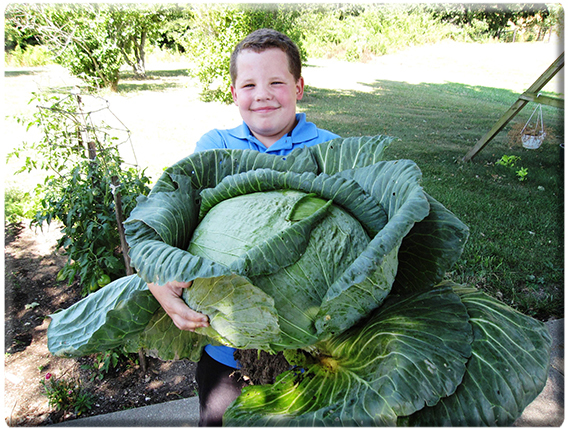 FRANKFORT, Ky. — Holden Underwood of Cox’s Creek Elementary School in Cox’s Creek, Ky., is the 2012 state winner of Bonnie Plants’ annual third-grade cabbage-growing contest. Holden’s cabbage grew to 20.5 pounds. He was selected at random from among 65 classroom winners from across the state. Holden earned a $1,000 scholarship from Bonnie Plants, which delivered 21,516 cabbage plants this past season to third-grade students at 284 Kentucky schools. “I want to congratulate Holden on his tremendous accomplishment,” Agriculture Commissioner James Comer said. “It takes a lot of attention and care to grow a cabbage to more than 20 pounds. “I hope this contest will get students interested in agriculture, help them understand where their food comes from, and enable them to learn the basics and joys of gardening,” Commissioner Comer said. Holden planted his cabbage in his grandmother’s garden, and she taught him about fertilizing and watering his plant. Holden said the experience caused him to plant lima beans after he harvested his cabbage. “I have decided to plant some more vegetables in the garden next year and enter them in the state fair,” Holden told Bonnie Plants. Bonnie Plants, based in Union Springs, Ala., distributes cabbage plants to third-grade teachers to give to their students. Students raise the plants and submit photos of themselves with the full-grown cabbages. Classroom winners are determined by the size of the cabbage heads and the overall appearance of each photo. Statewide winners are selected in a random drawing of the classroom winners. A representative from Bonnie Plants will present Holden with a winner’s certificate and a large presentation check at the Kentucky Agriculture Day luncheon March 27 at the Thomas D. Clark Center for Kentucky History in Frankfort.